By day, 24 year old Katerina Reed runs an online marketing company with her partner, Veronika. She enjoys travelling, spending time with friends and family while having walks with her dog, Joey. 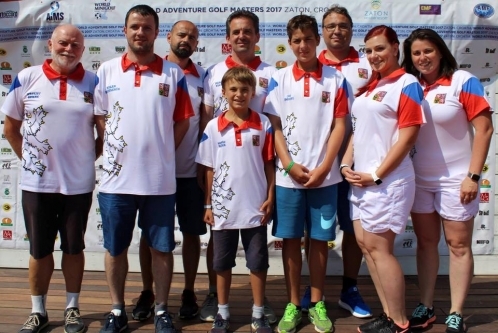 However, on September 12th, Katerina managed to become the new women�s World Adventure Golf Masters Champion. On her return to the Czech Republic, Minigolfnews� Steve Lovell caught up with Katerina to ask her beginnings in the sport, how she coped in the adverse conditions and what it means to host next years event. SL: When did you first pick up a putter to play minigolf? KR: Well, as I don�t count any random holiday fun, where everyone tried to play minigolf, I�d look back to summer 2013. Then, I started my part time job in Horni Bezděkov at the course as a waitress. Daniel aimed to show every new bee how the course works and took me to play a round. He was telling me how to play each lane and I scored somewhere around 45. For real, I started to play in 2015, when my partner Veronika asked me to play with her the league in Horn� Bezděkov. SL: I've only see you play adventure golf. Have you played the other variants of minigolf and what is it the you enjoy about minigolf? KR: Generally, I�d say no, only Adventure golf. With the team, I have visited many courses around the Czech Republic and last year in Kosovo, it was my first foreign tournament. With adventure golf, first of all, I love the variety of the courses. And the fact that there is a million different ways you can play one hole. SL: Last year in Kosovo, there were just the three women playing. This year in Croatia, there were sixteen. This is great for the women's game. Do you think in future that there could be a separate Women's WAGM tournament if the number of female athletes continues to rise? KR: I am very happy about the rising number of women playing WAGM and adventure golf in general. But to be honest, I don�t think it would be the right way to separate male and female players into two tournaments. I�d rather look for an example in minigolf, where there is now about 150-200 players male and female together, but playing on two courses and for three days. I believe that this should be the direction. I enjoy playing next to men and especially big adventure golf names, trying to catch up with them and even beat them. Who knows, maybe one day, WAGM will be won by a woman. SL: On to this year�s tournament, when did you arrive for practice? KR: We arrived on Tuesday evening and started practicing on Wednesday. Being in such a great place as Zaton Holiday Resort is, I was longingly looking towards the sea and pool area but Veronika as my coach was hard to me (in a good way, of course) and she knew why. SL: The Czech Adventure golf team have always come across as a friendly bunch to be around, you all look so happy to be playing. Does that make you more relaxed when it comes to tournament play? KR: It�s nice to hear it. Generally, we really enjoy ourselves at the course, we maintain the good atmosphere within the team and someone like Matěj, for example, is all over the place, practicing with everyone. During the tournament, we keep watching and supporting each other, if someone is not having a good round, we are there to go and give them a boost of positive energy. SL:The day of the competition arrives and so did the rain. What did you do to pass the time? KR: This was a very unusual situation. In the middle of the day, we ended up in one apartment (only two members of the team were imprisoned in their houses by running water). Seven of us were playing games and later on, our Matěj started creating lanes in that little apartment and we were �practicing� with him. Maybe that was the secret of our success? SL:When the WAGM finally got underway, you stormed into the overall lead at the end of the day. Have you had much experience of playing in the dark and were you surprised to be leading? KR: Funnily enough, I had. Every year, we play at least one night tournament, when we switch off all the lights and we only use torches to see where the hole is and which direction approximately to play. Apparently, these conditions worked for me. Throughout the whole first round, there were Czech tourists following me and supporting on every lane. I really enjoyed that round and couldn�t believe my results were one of the best after the first round. SL:Day two came and you looked to be cruising to the women's title. Then, Veronika caught you in the final round. Were you feeling the pressure? KR: Veronika is a very experienced player and she is known as someone who never gives up and keeps pushing all the way. When she was about to start her last round, I told her: �Go ahead, beat me, do, what�s possible, you do it for the team!� And I really meant it like that. I didn�t care whether I end up first or second, but I saw an opportunity for a Czech team 1 to reach a medal. SL: The Czech team finished last in 2015. They've won the silver in 2017. Why do you think you are improving so much? KR:It all comes down to hard work and effort. In 2015, we played only with putters and golf balls, no rubber, no minigolf balls. We have made the decision to move forward, out of our �small world� and join the international players in their game. Daniel Vlcek�s effort is remarkable and he is the one to be mentioned in the first place. The rest is just dedication and team belief that we can make anything happen. SL: You had a playoff for the title with Veronika. From the video of the playoff, it looked fun but competitive. What was it like playing your partner for a world title? KR: Ever since I started to play adventure golf, Veronika was my coach. This year there were some tournaments where she had to push herself to beat me. She was practicing a sentence �you�ve got a great coach!�, in case I had won. I would never have guessed that the time may come on a new course, during the WAGM. Playoff of this kind was a new situation to us and we both enjoyed it. I won over her by a shot from bunker, where she missed. I told her before playing it, �If you miss this one, I do deserve to win, I was there twice during the tournament and twice scored two.� It was meant in a nice way and in the end she�s happy for me, as a great coach. SL:What did you think of the Zaton resort and the people of Croatia? It looked great. KR: We had a brilliant time, this place is very unique for World Adventure Golf Masters and provides everything you may even think of. In spare time you can go swimming, have fun. People were kind and very helpful, all the stuff were always there when you needed them. SL:Next year, of course, we play the WAGM on your home track in Horni Bezdekov. What does that mean to you as a Czech national that the world is coming to play in the Czech Republic? KR:This is something fantastic! For us, it�s a huge event and we have been already working on plans for next year to make WAGM 2018 unforgettable. I think I can talk on behalf of all AGHB Team that we are honoured to be an organiser of World Adventure Golf Masters. From all of us, huge congratulations on being the new women's WAGM champion, Katerina.